Friday Katja was playing the short handed NLHE 6-max $2500 event. She busted in the first 60 minutes when she lost a flopped set to a flush and an overpair to flopped two pair. You really can’t do that much about this. There was one hand that Katjay is steaming about, still. She had AKs and raised to 300 (25/50 blinds) and got a caller. Flop came down AQ6 two-suited but not her suit. Her opponent out-of-position went all-in right away without any hesitation! After a minute of thinking Katja layed her hand down. When we discusses the the hand I thought right away that I could never make this this laydown and I think it was wrong. Katja is now thinking the same. When we went through the hands this player could have had it occured most likely that he had one of those: AJ, QK/QJ or a flush draw. We talked for long about AQ or a set but given that this is a 6max very aggressive table we think he would have trapped as he could have been assured that Katja would fire that second bullet. Well we never know but that hand still bothers her. That afternoon I played the first life seven-card stud hands since very long in a 20/40 game at the Bellagio. It was like swimming, it took me only one or two hands to get back into that game. I made a nice score of over $1000 there in two hours. When Katja came from the Rio’s we went into Bellagio’s buffet for a late lunch. Back in the stud game I gave something back and had a $700 winning session when my seat for the 30/60 holdem game was called (about 5 hours waiting, Bellagio is a madhouse these days!). The lineup was just about all you can ask for, 2-3 young players with sunglasses, 2-3 old rocks, 3 aggressive asians and the downstaring mob-like looking guy. The game was good right on and got only better later. “Good” means here that there was lots of action and people chasing any kind of hands for 2 or even 3 bets. Unfortuntly good here means not that I have won as I didnt. Again I lost many flopped straights and flushes and even one or two flopped or turned boats. From 7 sets I won two (both times QQ), all others went down. One of the nicest hands was against the ultra-aggressive female asian player (playing Liz Liu style) when I had JJ and the flop came town J74 offsuit. I was first to act, five more players in the hand. Believe me, on that tabl was no reason to slowplay anything so I bet out. It got raised and the asian player made it three bets. I four betted my set and we got one caller, asian woman called. Turn is a nine, I bet, guy calls, asian moman raises! I think for a moment and raise again, other guy folds, she calls. River bring out the Q, I bet, she raises, I just call fearing QQ but got shown KTo for a straight. That describes both the table style and the results I show over the last days. To whine a little bit more there is just no justice in the last week. The hands I lose against here at the live tables over the last three days make online 30/60 look like rock-solid games. We went to sleep about midnight as we had a scheduled hotel change that we needed to get down early, we changed to the Wynn. The Wynn is fantastic. Quality and service is so great here compared to the MGM group, really nice. 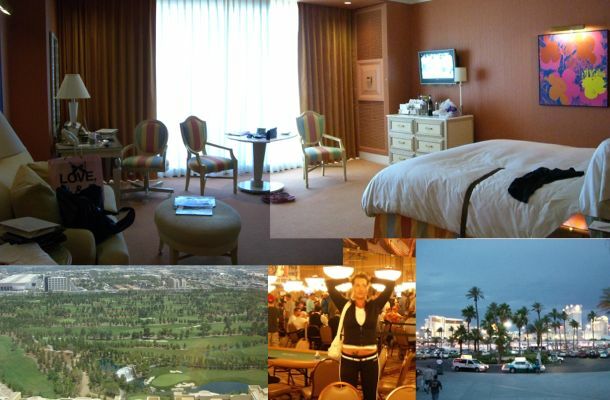 The pictures show a standard room, the “worst” they have (You get one of those for $129/day on poker rate, 8 hours play required, on weekdays). Katja drove over short before noon to the Rio’s to play the $2000 NLHE event. We my phone rang about 30 minutes later I feared that she is already out (she had announced a playing style change to me) but she just called me to say she doublep up thru Chris Bigler. Later on the told about the hand: Katja had A2 of diamonds on the button, two players limped, she limped also as did Chris in the SB. BB checks. Flop comes 224. UTG bets 300, Katja just calls, Chris makes it 700, UTG folds and Katja shoves. Chris calls! Katja said she had visions of pocket 44 when he called for all his chips but all he turned over was TT and Katja won the hand. Two hours into play she called me again during the first break and told that she just lost half her stack with QQ against KK when the flop came T high with no flush or straight possible. The player holding KK had just called her raise pre-flop and when he reraised her for all his chips on that flop she just had to call. When my phone rung again about 45 minutes later I knew it was bad news; and yes, Katja lost her remaining stack again with QQ this time vs AA. Katja was in the BB, holding those QQ. There were two limpers and the SB, sho just completed. Katja explained to me that the was dead sure that both limpers did not had her beat from their playing style so far. That left the SB player but that guy could have anything. In fact, a big hand was unlikely as you would expect a raise given two limpers in the pot already. Anyway, Katja decided to not get fancy and raised all-in for her ~2000 chips into the 400 pot. Limpers folding but SB guy really had AA. No help to Katja on the board and she was done. I can tell you, we are not too happy how things are going here for us.